The holidays always slow things down a bit, but we’ve had a busy few weeks since Christmas. The action picked up almost immediately with Robin Bates hammering on the film production company for the repair of the carpet in the Courtroom. Part of the sewage pipe. During the film production many of the crew brought their dogs into the prison. Robin’s legendary persistence has paid off and the company has agreed to pay $4,000 for the replacement of the carpeting. This should be completed before the end of January. Good job. Robin! This replacement has been approved by the State Historic Preservation Officer. Another consequence of the film production was the disintegration of the sewer system in the Courthouse from overuse. The system was serviced by a lift station whose pump has repeatedly failed. 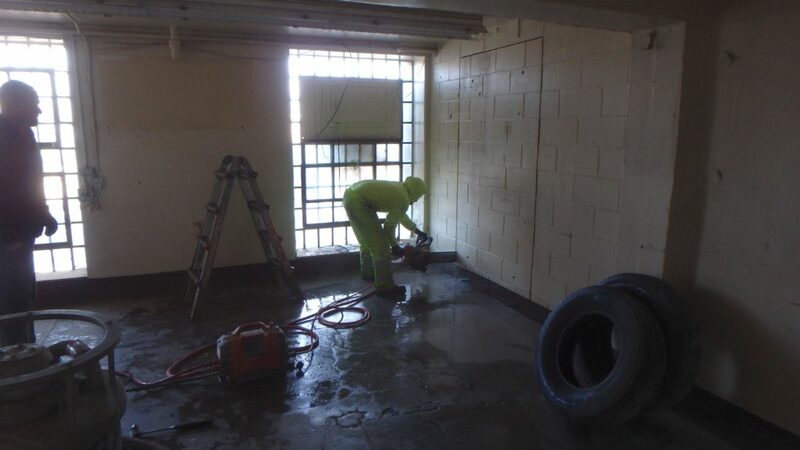 Nevada State Prison Preservation Society paid to have the lift vault pumped. NSPPS Maintenance Chairman Maurice White, accompanied by members Lee Perks, Terry Hubert and Joe Kinsley, dug into the system to determine the problem and found that it suffered a catastrophic failure. With sewage leaking, they immediately went to work. They determined that the lift station was not needed. 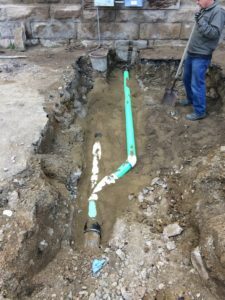 They adjusted the grade of the sewer line and installed two new pipes with appropriate couplings. They bedded the line and filled the hole. We are so grateful for the initiative, skill and effort of our guys. So … On the last day of this emergency, I’m standing around watching our guys doing the heavy work. I gave myself a 70th birthday gift of a cracked tailbone by falling on a set of stairs. Walking was OK. Lifting a shovel was not going to happen. I strolled over to the vicinity of the pile of debris that was the sewer lift station. I spotted a small, uniform piece of metal on the pavement and knew that this meant something manmade. Carefully bending over I picked up an expended bullet casing. I rubbed off the dirt from the bottom of the shell and was elated. 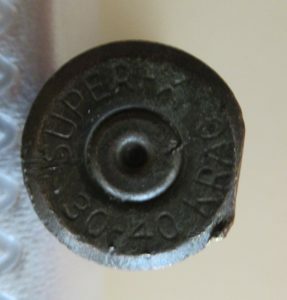 In case you have trouble deciphering the lettering it says “30-40 KRAG SUPER.” I know enough about guns to know that this was the bullet used by the Army in the Spanish-American War. The rimmed .30-40 round, also known as .30 Army, was developed and used in the Model 1892 Krag/Springfield rifle. Although the .30-40 Krag was the first smokeless powder round adopted by the U.S. military, it retained the “caliber-charge” naming system of earlier black powder cartridges, i.e. a .30-caliber bullet propelled by 40 grains (2.6 g) of smokeless powder. The first use of a smokeless powder round by Winchester was a single shot in 30-40, and it was one of only three rounds chambered for the 1895 Winchester lever action, introduced in 1896. From the outset, the .30-40 cartridge proved popular for hunting, and was chambered in a variety of firearms. In 1899, a Krag in .30-40 caliber was used to shoot the world-record Rocky Mountain elk. The record stood until the latter half of the 20th century. 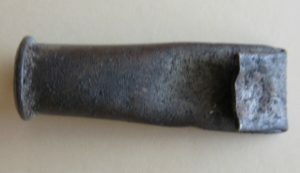 In October 1899, after reviewing the experiences of the Spanish–American War, U.S. Army ordnance authorities developed a new loading for the .30 Army used in the Krag rifle, in an attempt to match the ballistics of the 7×57mm Mauser cartridge employed by Spanish forces in that conflict. The new loading increased the muzzle velocity in the rifle version of the Krag to 2,200 ft/s (670 m/s) at 45,000 psi. However, once the new loading was issued, reports of cracked locking lugs on service Krags began to surface. In March 1900 the remaining stocks of this ammunition (some 3.5 million rounds) were returned to the arsenals, broken down, and reloaded back to the original 2,000 ft/s (610 m/s) specification. In 1903, after recommendations from the infantry Small Arms Board, the U.S. Army formally adopted a higher-velocity .30-caliber replacement for the .30-40 or .30 Army cartridge. The new cartridge was designated by its year of adoption, the .30-03. The Gatling gun that was on the walls of NSP is a .45-70 caliber weapon, so this artifact probably came from the Krag rifle, or the Winchester 1895. On Jan. 9, Lee Perks and Maurice White supervised the cutting of two passages through the cell house. These openings were cut into cinder-block walls that were installed to separate A and B Blocks on the first floor, and to create separate work spaces in B Block. This cutting was done by Diversified Concrete Cutting and paid for by NSPPS. This will allow passage through the entire cell house and ease access to the Max Unit, the Culinary and the Execution Chamber. This project was approved by the State Historic Preservation Officer. A worker cuts through part of the cinder-block wall. Our projects grabbed the attention of the State Public Works Board. The Building Inspectors looked at our projects and ordered any further work to be stopped until a work permit was obtained. Given that the institution still belongs to the Department of Corrections, the work permits have to be obtained by the NDOC. We are working to set up meetings with the deputy director of the department to get our projects included into the department annual permit. This annual permit is for projects costing under $100,000. This means that our projects could be handled by an abbreviated process. This situation points out the complications of being a private, non-profit organization working on a government owned facility. Just remember, you don’t lose till you quit. Our experience supervising the movie production late last year was an educational one. Based on discussions amongst our volunteers who worked the movie we had a “Lessons Learned” meeting on Jan. 12. This meeting resulted in 35 items to add to or modify our location agreement. These suggestions covered better protection for the prison site, limited access, security bonding, and fiscal responsibility. Our volunteers put in thousands of hours on this production. I presume that if we do this again that it will not be complicated by a herd of horses. The Warm Springs Correctional Center has a new warden. We toured Warden Perry Russell and new life member Associate Warden Lisa Walsh through the entire institution on Jan. 12. This included a viewing of the execution chamber. Director James Dzurenda has given us access to the chamber when we get our change of use permit. Warden Russell was very impressed, as is everyone who views Nevada State Prison.